1- 360 degree rotating phone holder,you can adjust any angle as needed to view, take photos or shoot videos. 2- Universal cell Phone Holder , Adjustable 2.3-3.5 inch wide phone holder, like iPhone 8 plus, 8, 7,7 plus, X, 6, 6s/Samsung Note 8,S8/LG/HTC.ect. 3- Rubber Cushion Clamp , anti slip rubber can protect your tables. The clamp can be adjusted from 0 to 2.75 inch, suit for tables thicknesses within 2.5inch. 1- 3 colors mode - white light, Mixed Light, and Warm Light. 2- 10 adjustable brightness - 10 level for each lighting mode, optimize your lighting source as best. 3- Also used for desk lamp in reading time. No battery need,USB recharging, 57 inch length line support free moving in live broadcast, selfie. 1 * cell phone holder with selfie ring light. 3 COLORS LED LIGHT & 10 LEVEL BRIGHTNESS：3 colors lighting mode: white light,Mixed Light,and Warm Light. Each lighting mode has 10 Level brightness for your choose,match any style your need in different circumstances. 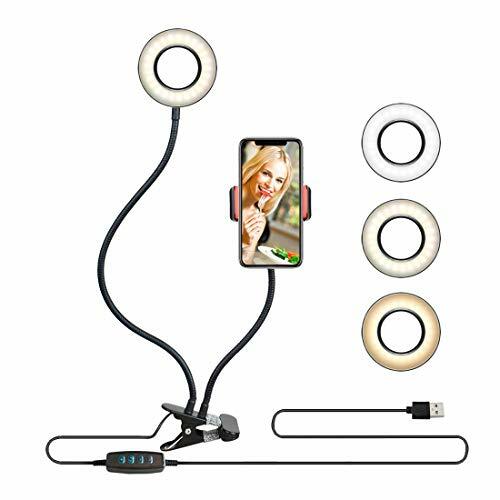 UNIVERSAL CELL PHONE HOLDER with LED SELFIE RING LIGHT：Combines selfie ring light and phone holder together. Gives Perfect light for makeup,Instagram,Facebook and YouTube videos,video calls,FaceTime, Twitch,live streaming and selfie. LARGE AND STRONG CLIP BRACKET：It's Secure and Strong,cell phone is not easy to drop down,Adjustable 2.3-3.5inch wide phone holder,360°Rotating Arms Lazy Bracket support most of phones,like iPhone 8 plus, 8, 7,7 plus, X, 6, 6s/Samsung Note 8, S8/LG/HTC.ect. FLEXIBLE & ADJUSTABLE HOLDER: 360 degree rotating cell phone holder with light, clamp on table & desk, adjust any angle as you like for convenient reviewing, taking pictures or shooting videos. It also works as lamp, mobile phone holder, selfie light. If you have any questions about this product by TEBLAMPUE, contact us by completing and submitting the form below. If you are looking for a specif part number, please include it with your message.